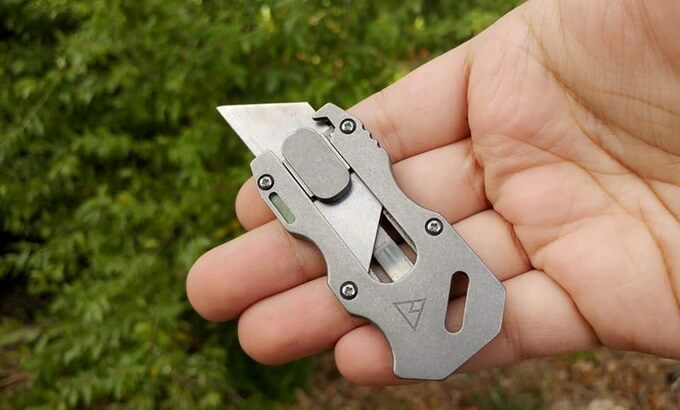 The EMT-EveryMan Tool is a pocket-sized multi-tool that includes several base features and also can be customized with several add-on features. The EMT packs a lot into a compact, cool-looking size and shape. At the heart of the EMT is a utility blade that slides to deploy and can be locked in virtually any position along its deployment path. It accepts standard utility razor blades for low cost and high availability, and blades also appear to be quite easy to swap out. Also included is the obligatory EDC tool bottle opening (which I find to be quite useful as a craft beer drinker). A flat head screwdriver and pry bar are also present, as well as a 6mm hex driver. It open slot can be used to attach it to a keychain or paracord lanyard. One of the more unique features is a 3x11mm Tritium slot that has a glow bead embedded in it to help you find the EMT in the dark. The EMT is made from stonewashed Titanium and Aluminum materials. As if all of that wasn’t enough, there are a whole host of customization add-ons planned, like pocket clips and various Tridium glow bead colors. The EMT-EveryMan Tool campaign ends on March 21, 2019. To date, over 200 backers have already pledged over $13,000 toward the $7,500 funding goal. Pledge packages start at $30 for a single EMT with standard blade insert, black paracord lanyard and green/blue glow bead and package prices increase from there pen of any of the style, or $195 for a set of all three. After the end of the campaign period, rewards are expected to start shipping in June 2019. Visit the EMT-EveryMan Tool campaign site for more information or to become a backer. Previous articleShould I worry about the Constrained Application Protocol?